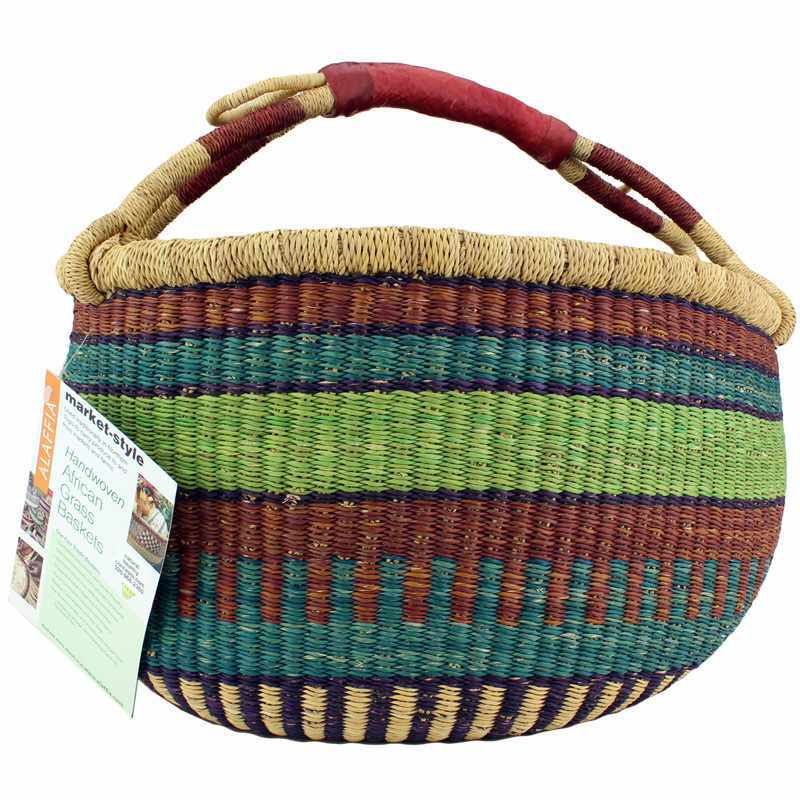 The colorful Round Market-Style African Grass Basket from Alaffia is hand-woven by the Alaffia Basket Cooperative in West Africa. It is light but strong and supple enough to hold up to 50 pounds of produce. Alaffia Baskets are made with sustainably wild-harvested savanna grass, which is well adapted to the West African climate and grows abundantly with minimal water or nutrients. Use of these baskets can reduce or eliminate your need for or consumption of plastic bags. Alaffia Basket Cooperative employs and empowers indigenous, West African women with fair-wages, safe, healthy working conditions and healthcare to help support their families and communities while carrying on their indigenous skills, knowledge and traditions. Baskets are unique and colored with natural dyes. Colors may vary and are not always as shown in photo. Colors will fade with exposure to direct light. Please store away from direct light to maintain bright color. To reshape your basket, spray lightly with cold water, shape basket as desired then dry thoroughly in a warm (not hot) area. I think these Alaffia Handwoven Baskets are the coolest thing ever! I love that all the Alaffia products are fair trade and that they help support women in Western Africa. Such a cool product and brand. I purchased 3 different baskets and soaps in 3 different transactions. Customer service is everything you could ask for! I will continue to give them my business.